Danbury's #35 Austin Calitro, center, gets tackled by Fairfield Warde's #7 Charlie Edison, during football action in Fairfield, Conn. on Saturday November 13, 2010. On bottom is Warde's #30 Alex Delaney. Fairfield Warde's #88 Kevin Sullivan, left, celebrates with a teammate after scoring a touchdown, during football action against Danbury in Fairfield, Conn. on Saturday November 13, 2010. Fairfield Warde's QB Chris Foley claps after #88 Kevin Sullivan scored a touchdown, during football action against Danbury in Fairfield, Conn. on Saturday November 13, 2010. Highlights of football action between Fairfield Warde and Danbury in Fairfield, Conn. on Saturday November 13, 2010. Fairfield Warde's #30 Alex Delaney. Highlights of football action between Fairfield Warde and Danbury in Fairfield, Conn. on Saturday November 13, 2010. Warde QB Chris Foley. Highlights of football action between Fairfield Warde and Danbury in Fairfield, Conn. on Saturday November 13, 2010. Highlights of football action between Fairfield Warde and Danbury in Fairfield, Conn. on Saturday November 13, 2010. Fairfield Warde QB Chris Foley, left, carries the ball. Highlights of football action between Fairfield Warde and Danbury in Fairfield, Conn. on Saturday November 13, 2010. Warde's #1 Alan Gray. Highlights of football action between Fairfield Warde and Danbury in Fairfield, Conn. on Saturday November 13, 2010. Danbury's #12 Nick Hammond, right, hands off the ball to #42 Brian Bill. Highlights of football action between Fairfield Warde and Danbury in Fairfield, Conn. on Saturday November 13, 2010. Danbury's Brian Bill carries the ball. Highlights of football action between Fairfield Warde and Danbury in Fairfield, Conn. on Saturday November 13, 2010. Danbury QB Nick Hammond. Highlights of football action between Fairfield Warde and Danbury in Fairfield, Conn. on Saturday November 13, 2010. Fairfield Warde QB Chris Foley. Highlights of football action between Fairfield Warde and Danbury in Fairfield, Conn. on Saturday November 13, 2010. 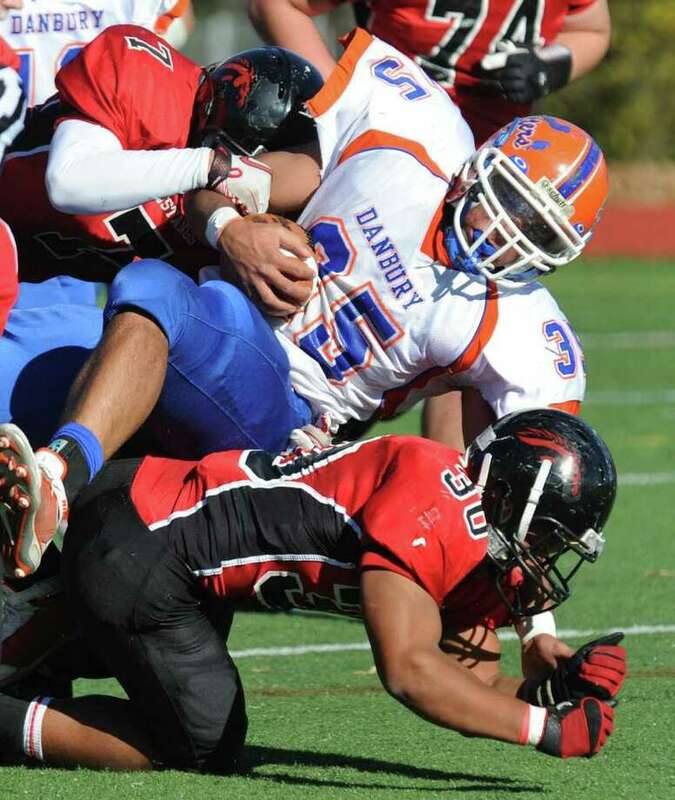 Danbury's #35 Austin Calitro gets tripped up by Fairfield Warde's #26 Craig Lowery. Highlights of football action between Fairfield Warde and Danbury in Fairfield, Conn. on Saturday November 13, 2010. Danbury's Aaron Dixon. Danbury's Brian Bill carries the ball to the endzone for a touchdown., during football action against Fairfield Warde in Fairfield, Conn. on Saturday November 13, 2010. Highlights of football action between Fairfield Warde and Danbury in Fairfield, Conn. on Saturday November 13, 2010. Teammates leap onto Danbury's Brian Bill after he made a touchdown.